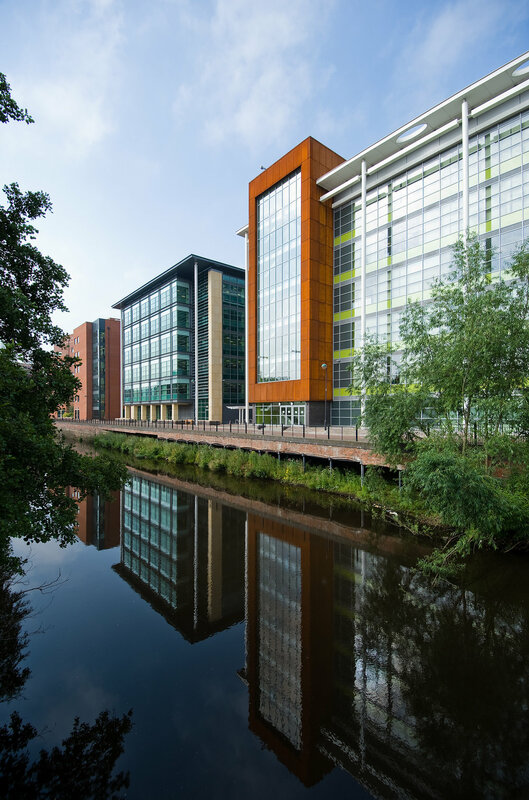 Located facing the River Don, this is the “sister” office building to the adjacent Vulcan House “Steel” development. Originally Vulcan House Iron was designed as a speculative office building for the developer Wilson Bowden. Completed in January 2008, the finished scheme achieved a BREEAM ‘Excellent’ status on both the envelope and internal fit out. The completion of the Riverside Exchange masterplan provides a new public square adjacent the river, which includes a café and specifically commissioned sculpture, creating a public amenity and the focal point of Riverside Exchange. The development enables pedestrians to utilise and interact with the riverfront environment, which is rich in historical, ecological, recreational and visual value. Our aim was to create an iconic building with distinctive façades which complements the newly developed area, but is clearly differentiated and unique when compared with the neighbouring elements of Riverside Exchange. The entrance and reception is defined within the sculptural, clean lines of two water channels which flank the tiled route to the glazed doors. An elegant canopy, informed by the language of the façade, projects over the entrance and welcomes the approach. Lighting is further used to subtly enhance the primary route, reflections on the water, give dynamic sparkle and highlights to the building fabric forms on strong architectural detail. The public are drawn into a clearly visible, well defined spatial environment. Circulation routes and powerful focal elements give clarity and logic to the space. The visitor is put at ease if they readily understand the space and their route through. 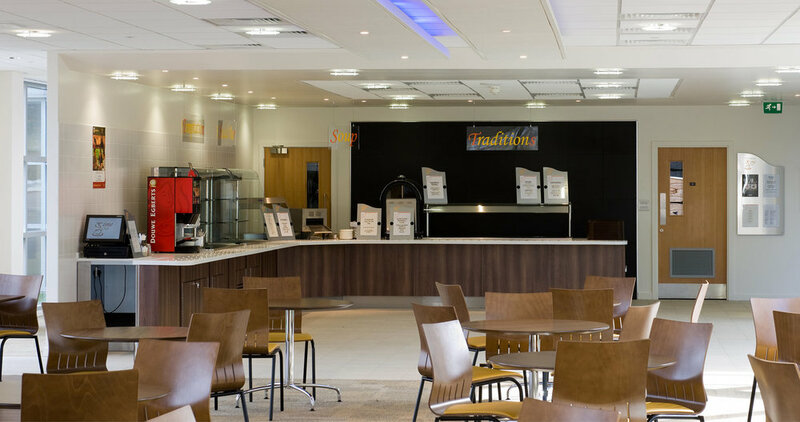 The staff restaurant is a rooftop haven, a space for relaxation, refuelling and recreation. It is an area which is critical to providing the necessary break from work and promoting social interaction, this ultimately boosts productivity and positive attitude in the working environment. The central lightwell encourages alternate views between office floors and the café/ restaurant at the sixth floor, thus fostering interaction and extending the sense of community through the heart of the interior space.